Madison Square Garden is the world's most famous arena. It is a multi-purpose indoor arena in midtown Manhattan situated atop Pennsylvania Station and is used for professional basketball and ice hockey, as well as boxing, concerts, ice shows, circuses, and other forms of sports and entertainment. Opened in 1968, it is now the oldest active major sporting facility in the New York metropolitan area. It is part of the Pennsylvania Plaza office and retail complex. 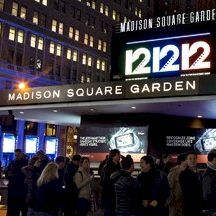 The Madison Square Garden is one of the top New York City venues for concerts and other events. Don't miss some of the biggest names in music as they come to New York City area's Madison Square Garden to perform live.